11. Save on Christmas cards. If you absolutely love doing Christmas cards, look into making them yourself, buying them on sale, or including your own photo rather than getting a custom-made photo card. Or mail your great Aunt Betty a traditional card and send free or low cost e-cards to your more web-savvy friends and family to save on postage and costs, while still letting them know you’re thinking of them. 12. Save on dress clothes. Do you really need a new holiday dress? Yes, then what else can you cut back on? It’s easy to find second-hand dress clothes for kids in excellent condition as they were usually worn only once, and at a fraction of the cost of new. 13. Save on eating out. If you know you have a busy week ahead, stock up your fridge and pantry with items for quick and easy meals, or make casseroles or batches of cooked meat to freeze and pull out as needed. A little bit of preparation will go a long way to help you save you the high cost of take-out and restaurant meals. 14. Make a budget and stick to it or beat it. Now that you know where to cut costs and are inspired by all the ways you can save this holiday season, sit down and write out a tangible plan, a budget that you are accountable to and that will challenge you to spend less this year. Make a list or spreadsheet, and assign a value to spend on each person’s gift, each dinner or event, and try to include all the expenses you can think of. Then update the budget every time you spend money, noting how much you spent and how much you saved so you have proof of your efforts. Keep a copy of it with you when you’re shopping and be accountable to it, you will thank yourself later. Remember to think of these numbers as the maximums. 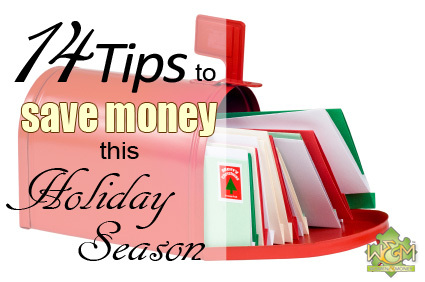 This physical budget is very important to keep you on track with your holiday spending and savings. UPDATE: Download our free printable Christmas Gift List and Budget for organized and on budget Christmas shopping this year. That wraps up our “Season of Savings” series, we hope you have found some helpful ideas, share them with your friends, and most of all have a wonderful holiday season full of love and savings.